Nubreed Nutrition, a brand we haven’t posted about too much but have been following, are getting ready to jump into one of the most competitive categories in the industry. The world of protein powder is a place a lot of big name brands have entered into over the past few months with the likes of Purus Labs, Evogen, and more recently ANS with N-Pro. Nubreed have now put their name on the list of established brands eyeing up the category with their upcoming protein supplement Myoblast. The product has been unveiled dropping very few macro details, with its most informative highlight being its combination of protein sources, milk isolate, whey concentrate, micellar casein and whey isolate. 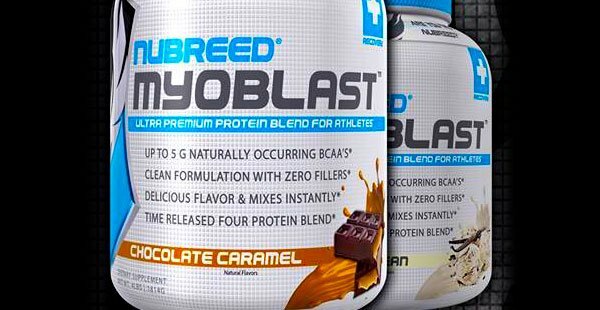 Nubreed have said they designed Myoblast to be one of the best tasting supplement’s in its category, definitely not an easy thing to do, with chocolate caramel and what looks to be vanilla bean two tastes to help deliver on that promise. Another thing we feel is important is the brand’s mention of no amino spiking. While this is a point almost every brand is promoting these days, Nubreed have said they have a third party test backing up that claim. Unfortunately we don’t know if it’s a service like our Stack3d Certified program or just a lab test from a tub they submitted, a question the brand are likely to answer as we near the launch of Myoblast.